A DISTINCTIVE light drawl, a voice that seemed wrapped in a smoking jacket. The aura of gentle regret, an eye on lost horizons. A man who, when he hears the word revolver, reaches for his culture. A man who shrugs his shoulders on the way to the guillotine. Actor Ronald Colman was particularly in favor between the last century's two big wars. By the time he became a star, his youth was long gone, mislaid in the trenches. Colman had his first cinematic breakthrough at age 32, in Henry King's 1923 silent The White Sister (shows April 15-16). Some 30 years later, Colman retired from cinema, just as Marlon Brando and James Dean were changing the public's taste. Still, it's worth recalling Colman's career in the 39-film retrospective starting this weekend at the Stanford Theatre in Palo Alto. The series alternates with an extensive Vincente Minnelli festival, and also features the opening of a gallery for the theater's collection of vintage movie posters. The retrospective is not just for fans of Colman's peerless gentility. Nor is it for those who'd like to be led through a long thread of studio-era cinema, including the work of Ernst Lubitsch, John Ford, George Stevens, Henry King and Joseph Mankiewicz. In essence, this series tends a neglected patch of film scholarship. First, remember how enormously popular Colman was. According to R. Dixon Smith's biography, Colman was voted the most handsome actor of 1935 by a jury of 51 of the best-known actresses of the day. John Ford, who directed Colman in Arrowsmith (shows May 10-12), called him "the greatest actor I have ever known." Director George Cukor claimed that Colman had "a face that was photographically perfect; his eyes, the way the light entered them, the bones, the skin. ..." Loretta Young recalled him as the first primarily dramatic movie actor to use humor. Colman's daughter and biographer, Juliet Colman, reports from her current home in Thailand: "We all have ideals, whether of a partner or parts of ourselves we wish to better. I think that RC's audience responded not only to his physical charms but to the part of himself that he brought to the screen. He truly was a gentleman to the core, incapable of any hint of vulgarity, graced with a voice to melt hearts and looks to match, plus he had a depth, maturity, intelligence and kindness, all of which jumped off the screen. We would probably all like to be kind, to strive and do better, and I think these aspirations resonated in his audience." True, Colman was the obvious choice when casting Continental trifles: the cricketer who was a gentleman thief in that grandfather of all caper movies, Raffles (May 10-13), as well as two outings as England's last line of defense, Bulldog Drummond. And yet Colman wasn't too perfect. He boasted a rakish side, and he was capable of showing how alcohol soothes the strain of the inevitable, as in the outtake scene where his character Robert Conway anesthetizes himself with booze in Lost Horizon (April 12-14). Still, Colman had a famous falling out with producer Samuel Goldwyn when the studio allowed the star to be libeled as "dissipated." Colman sued, escaping his contract. If dissipated wasn't the word, "detached" was. There is always a counterpoint in Colman, most visible in his award-winning role in the 1947 file-under-film-noir A Double Life (June 28-30). Colman's Anthony John, an actor, is a walking mask. Nobody really knows him. And thus no one knows well enough to recognize that he's on the edge of breakdown. "You can't stop, you can't limit yourself," he murmurs, mentioning, in an aside, the pills that keep him going. He has signed a yearlong contract to play Othello on Broadway. When John's Othello pleads, "I have done the state some small service," it's as if he's gently calling attention to the demands of his art. Anyone who mistakes Colman as an old-school pose-and-declaim matinee idol should see A Double Life. Here is an essential movie about acting as a disease and the neurotic energy that burns players up from the inside out. Colman's popularity is essentially a product of the interwar decades, providing the feeling of loss that was the undertone to his handsomeness and poise. The actor excelled in scenes of renunciation and doing the far, far better thing. But he was always fine at dual roles. The silent film Two Lovers seems to be lost; that bland chick-flick title disguises a swashbuckler with Colman as a masked vigilante of the 1500s called, alarmingly, Leatherface (it's based on a D'Orczy novel and directed by Fred Niblo, who did the first version of the similar Mark of Zorro). In another MIA silent The Magic Flame, Colman plays an actor who poses as a nobleman. In the sound-era A Tale of Two Cities (June 7-10), Colman famously plays a wastrel who takes the place of a look-alike hero. He plays two roles in The Masquerader (June 28-July 1): a journalist who has to pose as his drug-addled cousin and as a British member of parliament. And then there is his best-known impersonation: King Rupert V in The Prisoner of Zenda (April 7-11). There was a mask to Colman, certainly. Onscreen and in person, he was the quintessential British gent, but he was not of the top of the upper class. Like James Bond in the novels, Colman was half-Scottish, and his father died when he was young. Colman never attended Cambridge, as he hoped he would. He spent five dull years as a clerk and an accountant, which later served him wellhe had no problems with money and was able to leave the movie business well off. Colman was a casualty of the Great War; his leg was shattered by shrapnel at Messines in late fall 1914. "Nineteen-fourteen had nothing to do with his life, and yet it had everything to do with it"that's his daughter's summing up in her memoir. "There were never any war stories overheard, indeed I never heard him mention the war," Juliet Colman explains. "I think it horrified/tempered him in a benchmark way, instilled in him a sense of how tenuous and precious life is, how awful and noble is man." However divided he was onscreen, all accounts describe Colman as a whole man: the perfect balance of liquid-eyed sensitivity and impeccable manners. Cukor commented enviously that Colman "made a success of everything, of his career and his personal life." 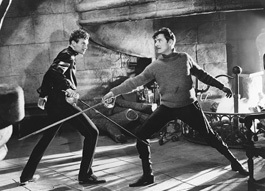 In memoirs, where actors usually shred each others, the swords get sheathed at the mention of Colman's name. Juliet Colman's bio A Very Private Man includes the range of people who remember him as good company, an outgoing host and a perfect father. The Stanford's retrospective is bringing around a wealth of rarely shown films. Here we can see Colman as a British army officer in the restored version of Under Two Flags (May 3-5), a turbulent desert epic, with Claudette Colbert togged out in what Graham Greene deemed "enchanting trousers." Colman is also seen trying to master the sands as the Eastern engineer who fails to predict the creation of the Salton Sea in The Winning of Barbara Worth (June 3-4). This silent will be worth seeing for the debut of an Adonis-like cowpoke called Gary Cooper. Moreover, it was filmed in the incomparable Black Rock Desert, site of Burning Man. Also coming up is the early Joseph Mankiewicz film The Late George Apley (May 24-26), plus Marlene Dietrich flashing her gilded legs in the 1944 version of Kismet (June 21-23). Colman is superb as Francois Villon in the Preston Sturges-written If I Were King (May 3-6), but he's hard to imagine as the lecherous Darlington in the silent version of Lady Windermere's Fan (May 27-28). Juliet Colman recommends Cynara (April 26-29), as well as the breakthrough The White Sister. "The White Sister has extraordinary photography, like Italian paintingsblack-and-white magic. I do wish I could be at the Stanford Theatre to see all the films again ... especially knowing the prints will be of the best possible quality, thanks to David Packard's passion for this era and his meticulous and assiduous attention." In today's cinema, there are too many gut-spiller actors who wear their hearts on their sleeveswhat a bloody mess. By contrast, the films of Ronald Colman makes a case for the attractiveness of concealed bravery, and the allure of concealed emotions.